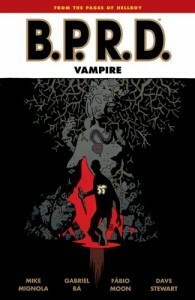 Mike Mignola’s Hellboy has spawned a whole fleet of spin-off books and interesting characters, and the issues collected in BPRD: Vampire center around Agent Anders, a man haunted – literally – by vampires. He has the spirits of two vampire sister locked away inside him, but the seal is weakening. He becomes obsessed with killing vampires, and with Professor Bruttenholm’s reluctant help, he sets off in search of the vampires’ gathering place. Fábio Moon, Gabriel Bá and Dave Stewart combine on the art, and it’s haunting. Gritty and monochromatic, save for the blazes of red from the bloody vampires. 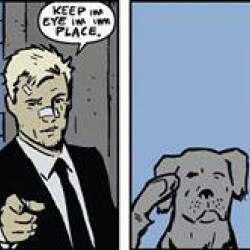 Not my normal thing, but it works for this. Story-wise there are a few twists I didn’t see, and I was surprised with where it ended and left Anders. If you’re tired of friendly/sparkly vampires, check it out.